The 2009 Buell XB12S for Sale has new ProTaper handlebars and grips, a H.I.D conversion kit, a Carbon fiber windshield, a new sound system (LOUD), Header wrap, blue under-glow, integrated Taillight, LED front blinkers, full Aftermarket exhaust, new Levers and a new rear tire. The XB12S has just 8500 miles on it. Here is a video of an 2009 Buell XB12S running. GoGoCycles would also encourage bikers to submit a review of the 2009 Buell XB12S for Sale to help potential buyers make informed decisions and to benefit the biker community. The 2009 Buell motorcycle for sale is located in southern Illinois IL and you can ride it home for $4000 (price is pretty firm so please don't try to low ball me on price)OR I might trade. 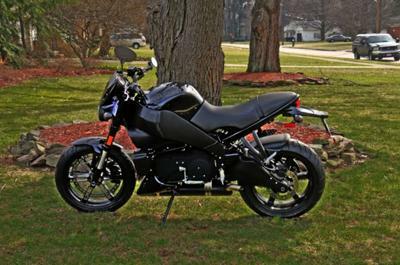 You can call me (no e-mail) at 618-204-911three for more details and when you do please mention that you found my ad on GoGoCycles Used Buell Motorcycles for Sale.